PC World customers will be the first in the UK to be offered Microsoft's Equipt office software as a service package, from next Monday. A £60 annual subscription buys a combination desktop/online service that includes: Microsoft Office Home and Student 2007 (with Word, Excel, PowerPoint and OneNote); Windows Live OneCare, the all-in-one security and PC management service; and Windows Live tools, such as Windows Live Mail, Windows Live Messenger and Windows Live Photo Gallery. 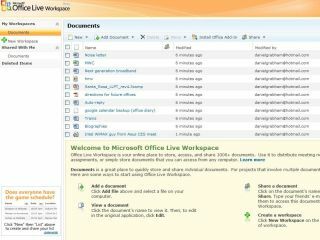 If Equipt here follows the US version (which is sold through Circuit City stores for just $70 (£40) a year), it will also come with Office Live Workspace, a dedicated online workspace where documents can be shared with friends and classmate. Whenever a new version of Office or Windows Live OneCare is released (probably 2009 for Office), Equipt customers will get free upgrades as part of their subscriptions. While Equipt represents a saving over the cost of buying Office (£100) and OneCare (£25), it looks pricey when compared with the free options out there. Desktop users who don't require the power and polish of Word or Excel might prefer the open source OpenOffice software, while the established cloud services of GoogleDocs and Zoho have wooed many mobile workers. DSGi, owner of PC World, Currys and Dixons, is currently the sole partner in the UK and will carry the Equipt service through PC World stores nationwide from 20 October.